The team that made this made Bravely Default, and it shows in the combat system. Each turn you gain a BP, you can use this to double up, or if you save it treble, and quadruple up moves. For a standard attack this will mean hitting 2,3,4 times, for a spell it means it will be much more powerful. You can't go in to 'debt' like in Bravely default, you can only use what you have. The reason the BP is important is because enemies have shield points, you can only reduce their shield by hitting their weaknesses. They still take damage regardless, but if you remove their shield they'll be more vulnerable and will skip a turn. If you knock the shield down at the start of your turn you can effectively have 2 full turns of them in a weakened state. Characters are dealt with in kind of a unique way. You can start anywhere with anyone, play through their story (chapter 1), then set off in to the world. Chapter 2 would require you to be about level 24, so while you're grinding you might as well pick up a bunch of new recruits, the other 8 characters. You can play each of their chapter 1s, which helps level them up, and you unless you're miles ahead at that point. this is where my main issue with the game has started to creep in. I'm about to collect my 5th party member, which means I've got to sit through some fairly dull writing (I liked the merchant's story tbf) for the 4th time, babysit a low level character while I burn magic with my stronger ones, who don't level up as often so don't get a free refill as often, although I should say replenish items are fairly common. When you're picking off weaknesses it can make fights a little drawn out. I’ve not started it yet but the Reviews I’ve watched all mentioned the repetitive Chapter 1s but once you get into the Chapter 2s it apparently improves considerably. We’ll see, I want to finish Ys before I start this. I started as the apocethary simply because I studied pharmacy lol. I’ve only played an hour so it’s too early to judge. Playing in handheld mode of course. In general I have no complaints about the game. You can play with Japanese audio which is always a plus. The music is lovely and stands out nearly as much as the visuals. I am 8 hours in to this, didn't really mean to pick it up as I am playing Fallout 4. I enjoyed the demo and once I hit 3 hours I simply had to continue. Oddly enough I got bored with Bravely Default but this is not happening here, totally engrossed. It is all I have done every night since release (once everyone is in bed). I started with the scholar and now have run through 5 of the intro stories, feels like a lot of introductions which I know I will forget as I am reading too many books at the same time :D. Looking forward to it all getting going now and so am headed to a chapter 2 (about 8 levels too low) so let's see what happens! It looks really lovely and has certainly pulled me in! All the ones I have completed have been local to each city so far, just a case to talking to everyone - having a thief helped a lot too as some items needed to be stolen from others. Not sure if they connect wider although I think they might. Started this earlier, put in around 4 hours. I didn't really know which character to choose of the bat really, all I knew was I wanted to avoid Primrose as I played through her chapter in the Prologue. I ended up going with Therion the Thief as my starter, not really sure why but I just thought the guys' stories could be less interesting than the ladies' stories so I thought I'd play all of them first and get them out the way. So I finished Therion's Chapter and it was excellent. I really liked him, he reminded me of Geralt in lots of ways, very sassy, sarcastic and mysterious and without going into spoilers his chapter went a lot less predictably than I thought it would and I can't wait to see what happens next in Chapter 2. 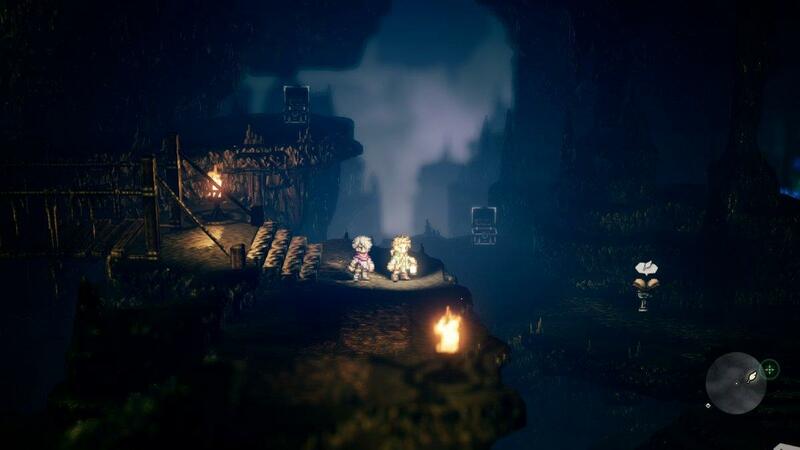 After this I wasn't really sure what to do - whether I just start up the first chapter of the next protagonist from the menu or what - I figured out that I had to journey to them in order to start their chapter so I made my way from Therion's town to Alfyn's town. 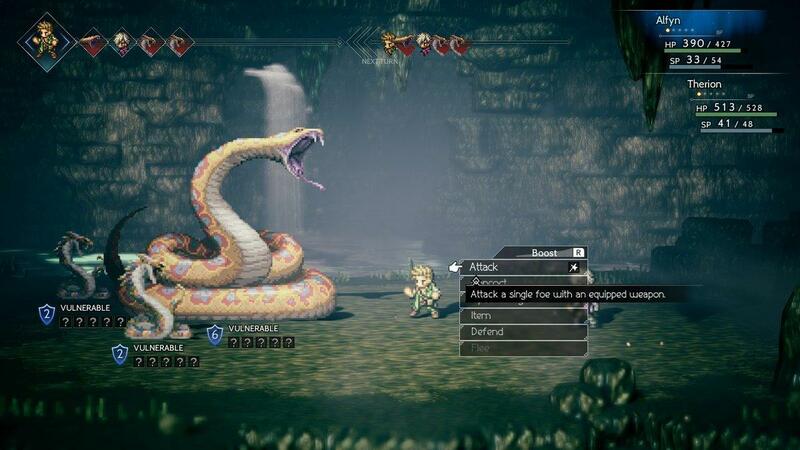 I don't think Alfyn's chapter is as good as Therion's, it's a bit more run-of-the-mill I'd say and doesn't really bring up too many surprises, his 'inspect' skill isn't anywhere near as badass as Steal either. So yeah, a very positive first impression. The visuals are phenomenal and the music is endearing already, can see myself spending a hell of a lot of time with this. god, I'm sick of all the Vita port begging. Not every game needs to come to the Vita! or maybe I'm just in a bad spot with it. I've tried starting chapter 2 with the scholar, but, even though I'm now a few levels above the required, I'm getting fucked. I'm doing better than I was, changed my team out to my stronger, more useful characters rather than trying to carry someone to level them up. I gained a few levels outside the town, earned more money to buy better weapons, equipped everyone with better armour. The problem is the enemies have strong multi-hit attacks, so everyone needs healing every turn, and if there's 4 or 5 enemies, you're fighting a losing battle unless you can stun a couple to let you catch up. I've switched to the merchant's chapter now instead, hopefully I can gain enough levels doing that, if not I'll travel elsewhere and just come back much later on. Funny, I got so bored of Bravely but this has sucked me in. Started Chapter 2 for Tressa now, recommended lev22 and I cannot get through it at all. The end boss can KO me in one round, lol. Its weird as everyone is around lev 22, not that far off. I agree that some of the battles can last too long, its simply a case of having enough stock in the inventory to make it through. Spent the last couple of nights wandering to bump them up a bit (I couldn't write that I spent 2 nights grinding) and will try the end of Tressa's chapter 2 again soon. Good idea to switch chapters, that might work for me also! I had to Google that also, I had no idea to begin with, not sure what party is best to be honest. I have H'aanit available but not used her, will try and see if she compliments better. I’m about 10 hours in on this now, got 4 of the 8 characters. 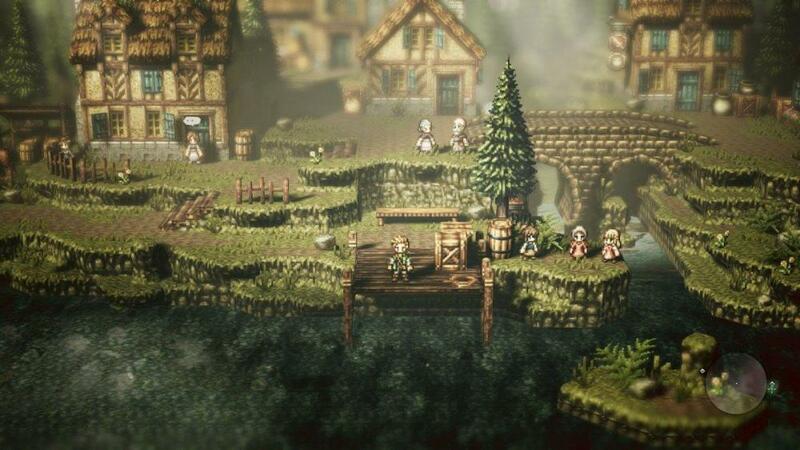 So far I’ve picked up Olberic, Primrose, Alfyn and Therion. I haven’t really had the best of times with it since my first post. It can be excellent at times (Primrose’s story is still the best I’ve experienced so far) but the repetitive chapter 1s aren’t doing it any favours at all. I know it’s meant to get way better once you reach the Chapter 2’s but at the moment I am struggling a bit with it, it’s just a bit boring at times. 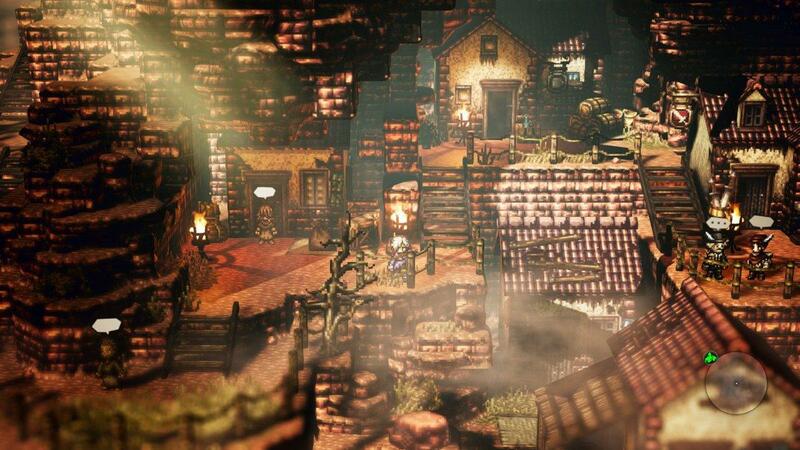 I know the structure of the game is purposefully old school but I just can’t help thinking this style of JRPG design has long been surpassed and bettered. It feels at times like I’m back in the 90s playing Pokémon Blue again on my Game Boy - the towns, routes, dungeons and even the combat system are incredibly reminiscent of the early Pokémon games sans the pocket monsters themselves. As others have said, the combat system is just a little slow at times. It’s fine when you’re facing an end of chapter boss and you really feel like your back is against the wall but just out exploring in between towns it bogs down the pace and exploration massively to be pulled into slow battles over and over again when you just wanna look for a chest or enjoy exploring a new area. A gauntlet of tough enemies followed by the boss, if you fail at any time you have to go all the way back to the start of the gauntlet - losing 3 hours of progress in the process. which makes me not really want to bother with actually trying to finish it anymore. I think I’d throw my Switch at a wall at that section, just cannot be arsed with shite like that in games anymore. I had a good run with this. I did chapter 2 for the thief, the doctor, and the knight, all with barely any grinding, no huge difficulty spikes, it all felt like progress. I thought I was over the hump with it, that I'd got to a high enough level with most of my party that I could carry the weaker characters until they gained the levels they needed. I'm now trying to do chapter 2 for the dancer. To get to her I need to go through an area that's level 21 then another that's level 27. Presumably because I've got a character that's level 41, and 2 that are 40, the enemies are absolute cunts. There's a boar in the lower area that can pretty much wipe out characters each turn, but he's not too much of a HP sponge. Then in the level 27 area there's polar bears who hit hard enough with a party attack to wipe out multiple party members unless I've boosted defence or everyone is at absolute max. Sunk a couple more hours into this today and I’m going back to play it in a minute. I completed Tressa’s first chapter so I have four party members now. This might not re-invent the wheel for jrpgs (although there are plenty of unique aspects to it) but it’s a really solid game. I like the tone of the game in general. The environmental art is really lovely, especially when you transition from one type of area to another. 15 hours now and I’ve collected my 7th party member, H’annit. I’m really enjoying this game. Looking forward to getting stuck into the next chapters. 18 hours in now and I’ve collected all 8 characters. My initial character Alfyn is at level 20. Before I head towards the second chapter areas I want to retread my steps and head into some of the slightly higher level caves that I didn’t explore. I’m so jealous of everyone playing this. I need to try and convince Elena to get me a Switch for Xmas.